My best tip for a financial turnaround that will help you get control of your budget and save big. If you are anything like me you are busy. So busy in fact that most of your days are spent on autopilot. I would just run through each of my days doing what needed to be done without thinking anything more about it. Nowhere was this truer than with our finances. The bill would come, I would write the check, and mail it out never giving it a second thought. When our family was hit with a layoff out of nowhere I knew I needed to find ways to help lower my bills. 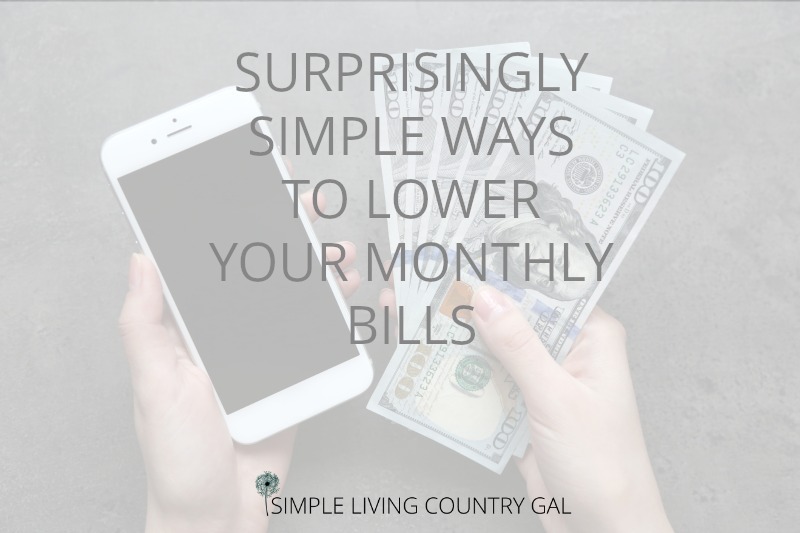 When you think of lowering your monthly bills thoughts immediately go to a lower grocery budget, fewer trips to the clothing stores, and eating out less. What if I told you-you could also lower your utility bills? Even your credit card bills? 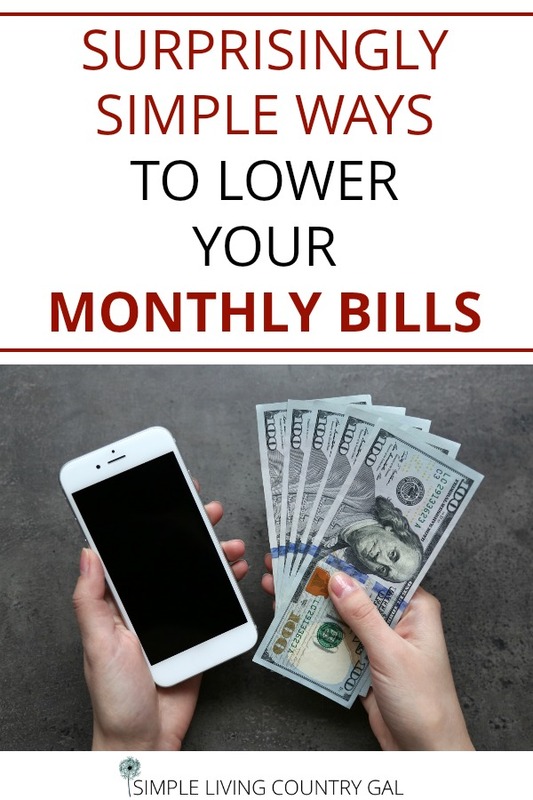 One day a few years back I thought to myself, there must be a way to help lower my bills so we could, in turn, lower our monthly budget. I got myself a pen, paper, and my phone and thought why not just ask. Little did I know that this one idea would save me over $3,400!! Although you may not have the same results, follow my steps and you may do even better than I did! 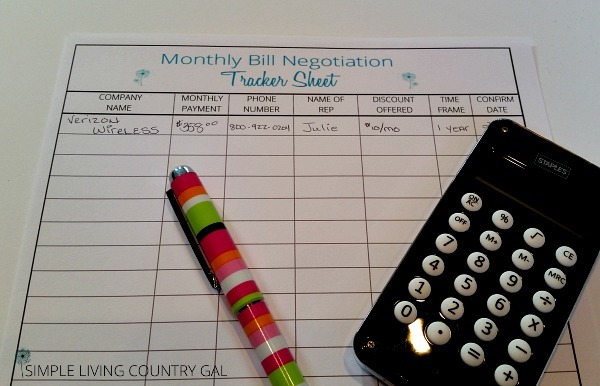 The steps I took to help lower my bills give myself a financial turnaround. What do I mean by “negotiable”? In my mind, if the bill fluctuates it is negotiable. Home mortgage, monthly rent, car payment or personal loan probably would not be on this list. The easiest way to find all of your negotiable bills is to pull your budget. If you don’t have one, (we will talk about this later..ahem!) your checkbook will give you the same information. Your list should include cell phones, cable or satellite TV, the internet, utilities, car insurance, credit cards etc. Step #2 Pull out your last bill for each item on your list. If you do not have a paper bill you can look it up online and print it out (I like to have paper copies in front of me for notes). On each bill make a note of how long you have been with the company, your monthly payment and any interest you may be paying. I find it helpful to highlight or list the phone number for each business I am calling. Step #3 Call each company to renegotiate your relationship. Don’t just assume you are getting the best deal year after year. These companies are very competitive and they want your business. For example, my first call was to my cell phone provider. I explained that we were on a tight budget and needed to cut back. I told them I had been with them for 10 years and I had no complaints but needed to find ways to save. The customer service representative instantly offered me a $10 discount off my bill each month for one year! The call took me five minutes and I saved $120/year!! She then looked over our plan giving me options to consider that would save even more money. Ninja tip: Do this by phone and not in the store. The reps on the phone are not on a commission so you do not have to worry about a sales pitch. I usually make my notes right on the bill. I list the date I called, the person I talked to, the discount or new interest rate I was offered and the effective date. You will want to verify the next month that your discount was applied. To make sure you do not forget to do this put a note in your calendar file. I have a file that I keep readily available to refer back to each year. If one of your discounts is not applied, simply call and explain that so and so made you this offer on this date. They will usually give you the offer no questions asked. So, what if you try everything and the answer is still no? Then, it’s time to get real. Ask yourself if this is something we really cannot live without? Does my family benefit from this service or item? Would the money spent on this service or item be better used elsewhere? Five years ago when I first started this we had satellite TV. We had the smallest package and admittedly at the time it was quite affordable. Unfortunately, I did not realize that each year the price slowly crept up until we were paying over $109 a month JUST FOR TV!! In the summer of 2015 we completely cut the cord to satellite tv and now we pay less than $20/month for close to the same channels. (for more info on this see my post–How We Ditched Expensive Satellite TV for Good) Yep, that’s a saving of over $1000/year!! Happy Dance! This is where it gets fun! Get out that calculator and add up all the savings!! This is how I did my first year in 2012. Home phone– I switched to a smaller plan since we had cell phones decreasing our bill by $8/month. Received a $10/month discount for a year. Total savings $216/year. Satellite TV–Received a $20/month discount for 7 months and also put our package on vacation mode for 5 months during the summer. Total savings $685/year. All in all, I spent a morning on this and saved our family $3,417 that first year! Now, you may not get the same results each year, but as long as you get something it is definitely worth the time. Remember it’s your money. You worked hard for it and you need to work hard to KEEP it. Make the calls, ask the hard questions, create a budget, and have a game plan and give yourself a financial turnaround. Get it on your to-do list every year! « Simple Living 13 Tips For Slowing Down. I think this article is very helpful for many of us! Thanks for sharing. We are syndicating it on the IBA this Friday, which is actually tomorrow! Haha! Please be sure to stop by and share. Have a great weekend and welcome to the IBA! I totally understand that you do not want clutter filling up your inbox…I wish you would change your mind! Not all of my newsletters are full of my sad attempts at being funny 🙂 some have some great tips and ideas as well. Not to mention a heads up on my new printables! If you only want the freebies and do not want to be a part of my peeps, just shoot me an email and we will chat! Great ideas. I have cut lots of this stuff out, but had not thought about trying to re-negotiate my interest rate on our one credit card. Yay! Off to make a call!